Could your electrical engineering resume use a little spark? Get hiring managers charged up by creating a resume inspired by our sample. To be considered for top electrical engineer jobs, you need a resume that generates interest. Could your resume use a little spark? Get inspired by our electrical engineer resume sample below, and download the sample resume for an electrical engineer in Word. 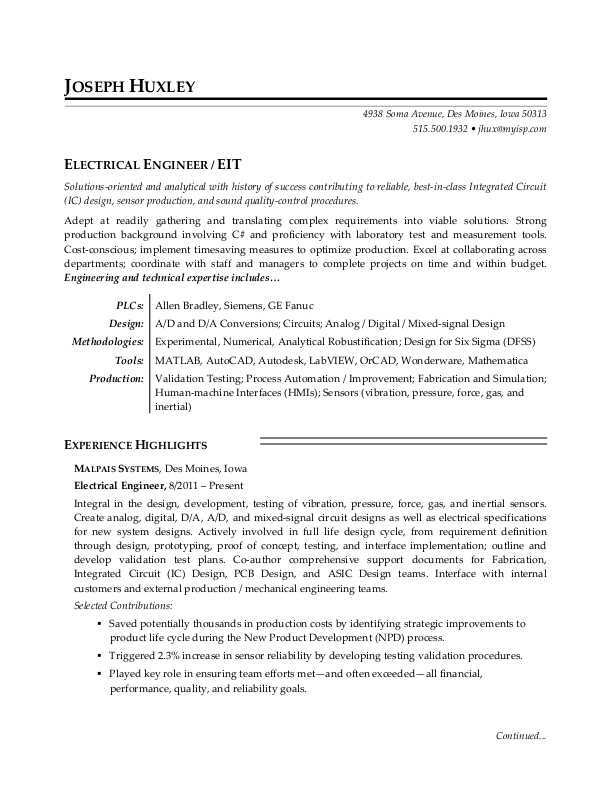 You can also check out an entry-level electrical engineer resume sample and a midlevel electrical engineer resume sample for additional resume format tips. Additionally, you can learn about engineering careers and search for electrical engineering jobs on Monster. Solutions-oriented and analytical with history of success contributing to reliable, best-in-class Integrated Circuit (IC) design, sensor production, and sound quality-control procedures. Adept at readily gathering and translating complex requirements into viable solutions. Strong production background involving C# and proficiency with laboratory test and measurement tools. Cost-conscious; implement timesaving measures to optimize production. Excel at collaborating across departments; coordinate with staff and managers to complete projects on time and within budget. Integral in the design, development, testing of vibration, pressure, force, gas, and inertial sensors. Create analog, digital, D/A, A/D, and mixed-signal circuit designs as well as electrical specifications for new system designs. Actively involved in full life design cycle, from requirement definition through design, prototyping, proof of concept, testing, and interface implementation; outline and develop validation test plans. Co-author comprehensive support documents for Fabrication, Integrated Circuit (IC) Design, PCB Design, and ASIC Design teams. Interface with internal customers and external production / mechanical engineering teams. Saved potentially thousands in production costs by identifying strategic improvements to product life cycle during the New Product Development (NPD) process. Triggered 2.3% increase in sensor reliability by developing testing validation procedures. Played key role in ensuring team efforts met—and often exceeded—all financial, performance, quality, and reliability goals. Served as core member of cross-functional team responsible for state-of-the-art sensor systems development involving vibration, pressure, and inertial sensors. Assisted in defining product requirements, identifying best concepts / designs, and implementing into production of new sensor solutions; incorporated DFSS design tools and methodology throughout design process. Created analog, digital and mixed signal circuit designs. Utilized PSpice to simulate circuit / sensor computer models and created electrical specifications for new sensor designs. Conceived solution to improve high resolution analog measurements and increase production quality. Contributed to increased throughput by rapidly diagnosing and correcting issue that impacted baseline performance. Successfully leveraged sound signal integrity principles and noise reduction techniques, leading to system robustification. Gained valuable hands-on experience supporting team of Electrical Engineers responsible for safe, efficient aluminum production. Performed quality / verification testing on pumps, valves, controls, and sensors in automated manufacturing environment. Built collaborative rapport with Controls Engineer to effectively conduct I/O Systems and Human-machine Interface (HMI) troubleshooting. Expertly performed preventative maintenance and calibration of equipment and systems, earning outstanding reputation for proficiency and quality. Is your resume wired for success? A resume is a lot like a circuit board in that there are lots of pieces that come together to perform a specific task. In the case of your resume, that task is getting you a great job. Could you use some help untangling the wires? Get a free resume evaluation today from the experts at Monster's Resume Writing Service. You'll get detailed feedback in two business days, including a review of your resume's appearance and content, and a prediction of a recruiter's first impression. It's a quick and easy way to help you put your most professional foot forward.